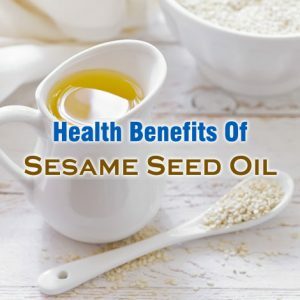 Sesame seed oil is light and nutritious oil and it possesses a number of health benefits and uses. It might not be one of the most popular oils but it is one of the best oils that can be used for healing a number of health and skin conditions. Sesame seed oil can be used for achieving healthy hair, radiant health and flawless skin. It is widely used for its healing properties. Experiments have also been carried out using this oil and they show how effective this oil is in unblocking clogged arteries. When applied directly on the facial skin on a regular basis, sesame seed oil can improve the texture of the skin and can also make it smoother and softer. Sesame seed oil possesses emollient properties that help in moisturizing the skin. When used in the form of massage oil, it can be of good help in detoxifying the body by way of the skin. Though it is a little heavier in comparison to the other massage oils, it can fetch amazing benefits for the users. Sesame seed oil contains various significant minerals like calcium, zinc and copper. All these minerals are important for the growth of healthy bones. Thus, it can rightly be said that by including sesame seed oil in your regular diet, you can actually maintain healthy bones and proper development. Sesame seed oil contains Tyrosine which is basically an essential amino acid directly connected to the release of serotonin in the brain. This can help in boosting mood by filling the body with hormones and enzymes that make an individual feel happy. Sesame seed oil can also be quite effective in lowering blood pressure in individuals. It is an edible oil that decreases lipid peroxidation and helps in increasing the status of antioxidants in the hypertensive patients. One of the important sesame seed oil health benefits is that it helps in controlling diabetes. Sesame contains Magnesium, and many other nutrients, which are helpful in reducing blood sugar levels. Sesame seed oil also helps in improving heart health. It contains Sesamol, which is an antioxidant, and anti inflammatory compound. This sesamol helps in prevening atherosclerotic lesions. Sesame seed is one of the good sources of vegetarian diet with high level of proteins. For one ounce of Sesame seeds, you can get 4.7grams of proteins. Apart from glowing facial skin, sesame seed oil provides many other skincare benefits. You can use sesame seed as natural moisturizer for skin, for repairing damaged skin cells, as anti aging agent, as natural sunscreen lotion, etc.